There's a rumble in the jungle . 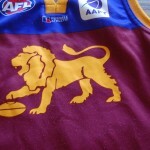 Some Lions fans , discontent with the newer "papplepop Lion " mascot on their teams footy jumpers , want a return to the older Lion moniker , as worn by the premiership teams of 2001 , 2002 and 2003 . Two Melbourne teams , the Demons and Saints fared poorly in their weekend matches , against the Hawks and Kangaroos respectively . It raises questions on the viability of Demons coach , Mark Neeld , chances of surviving in that role . The Saints miserable season continues . North Melbourne stalwart Brad Harvey , notched up 350 games , whilst fellow Roo Daniel Wells , achieved 200 . Saint , Leigh Montagna , also played 200 games but his milestone was diminished by his teams poor performance . 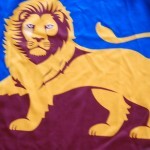 Monday night footy plays out tonight between the Eagles and Tigers , over in the West . This entry was posted on Monday, June 3rd, 2013 at 3:41 pm	and is filed under AFL, football jumpers, NRL. You can follow any responses to this entry through the RSS 2.0 feed. Both comments and pings are currently closed.